Paris once looked more lively. not knowing what’s happened to them. If there’s one horror genre that pops up ad nauseam, it’s that of zombies. Not a month goes by without a release in which undeath feast on innocent non-infected fellow humans. Since the cult film “Night of the Living Dead” by George A. Romero, a countless number of zombie flicks have already been made. Every once in a while they try to give it an original twist to make it more comical or profound. So that for once the emphasis isn’t on the bloodthirstiness and the jump scares. Something like “Attack of the Lederhosen Zombies” or “Warm Bodies“. These movies bring a smile to your face rather than scaring you. Others try to put in some more melodrama as in “Maggie“. 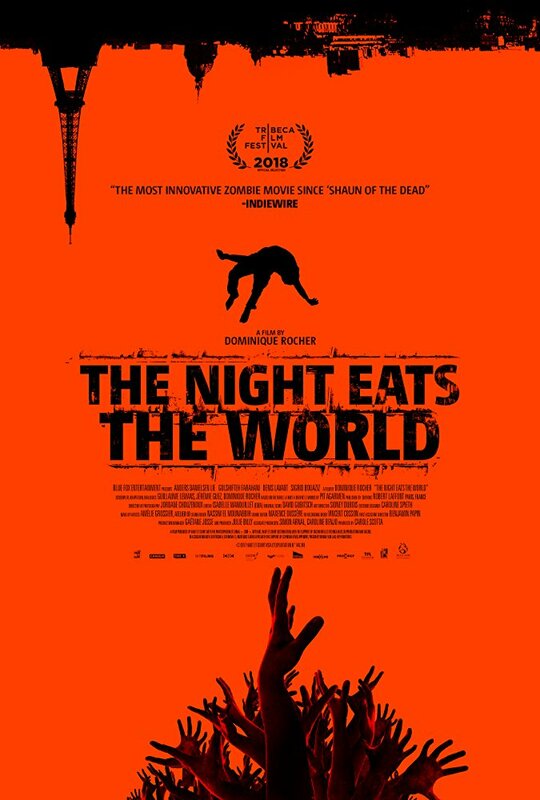 “The night eats the world” (original title “La Nuit a dévoré le Monde“) is such a film that tries to follow an alternative path in the zombie genre. Just like in “Dead within“, the film deals more with the psychological state of mind of a survivor than about the destructive character of the infected persons. Let’s introduce Sam (Anders Danielsen Lie) who dozed off in a back room during a party of his ex-girlfriend. And then he wakes up the next day in an abandoned flat where seemingly a chaos has broken out. Everything is a mess as if everybody left in a hurry and the walls are smeared with blood traces and splashes. Soon he discovers that the streets of Paris are taken over by a mob of zombies. Gradually he realizes that he’s lonely and abandoned in the building and that he must do everything he can to survive this holocaust. And that’s what you are presented within this movie. A portrait of a solitary survivor whose daily routine slowly turns into a rut. The isolation and loneliness take their toll. For those who associate a zombie film with bloody scenes and nerve-wracking moments, it will rather be a disappointing film. I’m sure that the words “boring” and “annoying” will be the most common terms used by seasoned zombie fans. But admit it. If you end up in such a situation, you will also have a limited daily life, resulting in a tedious dullness. A walk in the park around the corner, going for a newspaper or drinking a cup of coffee in a local bar are all options that belong to the past from this moment on. Because after the slightest noise, a whole myriad of mutilated zombies will be rushing towards you to consume you as a snack. In itself, the zombies don’t look so terrifying but rather moronic and stupid. Only the lack of growling or making creepy noises makes it rather frightening. So don’t expect any ominous sounds, bestial growls or threatening teeth chattering. If you really aren’t a fan of zombie movies and you leave skid marks in your underwear every time you see such a hollow-eyed creature appearing around a corner, I guarantee it, you can watch “The Night Eats the World“. You won’t experience a shuddering moment. The only thing you will feel is compassion. You’ll feel sorry for Sam. How he slowly withers away and gradually comes to terms with his fate and the fact that he can’t go anywhere. His only problem is his food supply and the lack of company. That’s why he keeps an infected old man locked in a blocked elevator and uses him as a partner in dialogue. And to kill some time (how appropriate), he uses the apathetic looking zombies in the streets as a target to improve his shooting skills with a paintball gun. Even though his part isn’t filled with entertaining dialogues or fascinating conversations, Anders Danielsen Lie manages to play a whole range of emotions in a convincing way. I thought the cunningly added twist was quite obvious. Don’t you think you’ll become delusional from such a secluded existence and the constant fear of an upcoming assault? The behavior of certain undead can even be called hilarious at times. And the relationship between Sam and his trapped neighbor is at least surprising. All in all “The night eats the World” is an original film with a unique view on the zombie genre.